Stefan Gary is a physical oceanographer with experience observing the large-scale circulation of the ocean and applying ocean models to better understand the ocean. As a Drawdown Oceans Fellow, Stefan is exploring how different ocean management practices can contribute to our overall carbon uptake. Stefan is also working as a consultant with a focus on automated data quality control from underwater robots and ocean climatology. He is an Honorary Research Fellow in Physical Oceanography at the Scottish Association for Marine Science, where he previously led observations on a long-term repeat hydrographic section in the North Atlantic, the Extended Ellett Line. Stefan now lives in New Hampshire with his family. Stefan has authored or co-authored 19 peer-reviewed publications, has led a 3-week deep-ocean research cruise and 3 Seaglider missions. He has a total accumulated time at sea of 4.5 months. 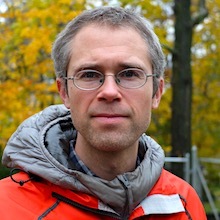 Stefan holds a PhD in Earth and Ocean Science from Duke University with a research focus on the export pathways of the North Atlantic Overturning Circulation. He also has an M.S. in Theoretical and Applied Mechanics from the University of Illinois at Urbana-Champaign, is a Returned Peace Corps Volunteer, and has a B.S. in Engineering and a B.A. in Art History from Swarthmore College. Earth and ocean science: export pathways of the North Atlantic Overturning Circulation.